Thanks to a 20-disc box set that will be released on Friday, October 20, we will now have access to 559 tracks of lost performances from our favorite country legends. At the Lousiana Hayride Tonight will include previously unreleased recordings, live performances, and transcriptions from over 150 artists like Johnny Cash, Elvis Presley, George Jones, June Carter, Faron Young, Jim Reeves, Hank Williams, and much more. The box set is named after the Louisiana Hayride Show that took place at the Municipal Auditorium in Shreveport, Louisiana. Back in the day, it was the spot country music fans flocked to every Saturday night for the best entertainment. 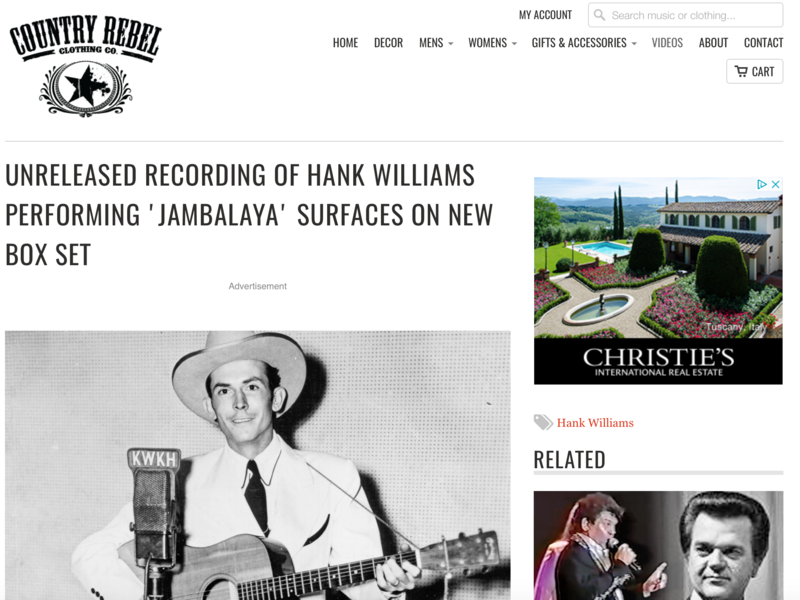 Hank Williams would often play there at the beginning of his career, and then towards the end. He first played the Louisiana Hayride four months after its inception in 1948 and once his career took off, so did the show's popularity. Williams performed what was marketed as his final Hayride show a little over a week before his famous Opry debut in August 1949, but he eventually returned in October 1952. That night, as he was being introduced by Horace Logan, the announcer told the audience that if they enjoyed his song, he might sing another and if they enjoyed that, he'd be back the next week to sing even more songs. A little over two months later, Hank Williams passed away at the age of 29. After Logan's introduction, Williams dove into a song he had written years prior when he was in Louisiana called "Jambalaya." The audience went absolutely wild! This unreleased recording is unlike anything we've ever heard before. If you close your eyes, you can imagine the legendary singer being fawned over by these country fans while singing one of his most well-known songs. It also proves that there really wasn't, and isn't, anyone out there quite like Hank Williams. The box set is also sold with a 224-page hardcover book. To find out more information about At the Lousiana Hayride Tonight, check out their website here.